That science may have staked the future on? Should come to nothing must be fairly faced. The Monarch Butterfly is the king of the insect world. Even though they are small creatures, they do phenomenal things. First, they develop from tiny eggs, to a caterpillar, become a chrysalis, and finally transform into a beautiful butterfly. They migrate, traveling great distances to over winter in a temperate climate. Amazingly enough, not one butterfly makes the entire round-trip journey. Winter butterflies are sluggish and do not reproduce. In spring they return to summer homes and breed along the way. Their offspring return to the starting point. The Monarch butterfly's scientific name is Danaus plexippus, which means in Greek "sleepy transformation." The name, refers to the Monarch's ability to hibernate and metamorphize, and is inspired by a Greek myth about the daughters of Danaus, who flee Libya for Greece in order to avoid marrying. The long, migration of Monarch butterflies reminds us of Danaus' daughters' flight. Each adult butterfly lives only about four to five weeks. But one of the many wonders of the Monarchs is the annual creation of a unique "Methuselah generation." As autumn approaches in their sites of migratory origin, a very special generation of butterflies is born. Unlike their parents, grandparents, great-grandparents, and great-great-grandparents -- all of whom had ephemeral lives measured only in weeks -- these migratory butterflies survive seven or eight months. In human terms, given our average life span of 75 years, this would be like having children who lived to be 525 years old! Related species in the family are found on all continents except the polar regions, wherever milkweed and related plants are found. It also provides the Monarch with an intriguing form of protection, since the milkweed juices assimilated by the Monarch make it poisonous to predatory birds. The beautiful orange color of the Monarch butterfly serves to teach predators that their intended meal might be toxic. Not all milkweeds produce cardiac glycosides, therefore not all Monarchs are poisonous. However, the warning orange color serves to disguise poisonous from the non-toxic Monarch. Each Autumn, thousands of Monarch Butterflies gather in southern Canada to migrate south. Some of these butterflies travel over 2,900 kilometers, just to overwinter in places such as Michoacan, Mexico in a small town called Angangueo. Other Monarch Butterflies also overwinter in Cuba, and Pacific Grove, as well as Newark, California. In sanctuaries such as the one in Angangueo, Michoacan in Mexico there are millions of these gorgeous butterflies. From morning until about 1:00pm, they are most active. You can see them flying around and almost blocking the sky. You will hear the fascinating sound of their wings flapping. During their long flight there is a great danger from predators. Known as the unwritten eighth wonder of the world, the 3,000-mile migration of the Monarch butterfly is at high risk of being eradicated due to illegal logging activity at the Monarch Biosphere Reserve in Mexico. 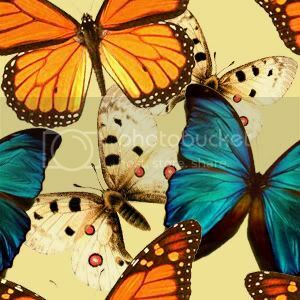 The Monarch Butterfly population, as well as numerous other animal species, is suffering the effects of man-made events as well as the consequences of the "global warming" phenomenon. Scientists assert that the global climate change may cause the Monarch's Mexican over-wintering sites to become wetter and the spring and summer breeding areas of the United States west coast and mid-western agricultural belt to become warmer. As temperatures become too warm for this species, their summer migrations may take them even further northward. Will the Monarch Butterflies migrate a further distance south to the current locations? Since researchers started keeping records in the early 1900's the winter sites have not changed. The Monarch's winter home in the mountains of central Mexico is greatly threatened today by tremendous logging operations of the Fir tree forests. This deforestation and increased agricultural development in Mexico is causing great concern. Along the populous areas of southern California many species of the Monarch Butterfly's roosting trees are disappearing, although the Eucalyptus tree is increasing in numbers for the butterflies. Local concerned groups are encouraging the conservation of trees for roosting, and the re-planting of milkweed plants for the females to lay eggs on in late winter and early spring. When semi-dormant in the winter the Monarchs need dense tree cover. And in the spring and summer breeding season they need abundant availability of milkweed plants. Although in North America the Monarch Butterflies are not considered an "endangered" or "threatened" species, they are highly protected under law, especially around their wintering roosting sites. As with every creature that has been lost to extinction, the Monarch is no exception. These fragile butterflies can drop in population as much as 50% in one year if conditions are not ideal. These legendary creatures may become just that, a legend, if people don't begin to take steps in reversing deforestation, climate change and other factors threatening the Monarchs.